Fisker plans to begin European sales of the Karma plug-in hybrid by the end of the year. DETROIT -- Fisker Automotives first car has a lot of Europe in it. The US-based automakers top two executives are from Europe and worked for European brands before founding the company in 2007. In addition, the Karma plug-in hybrids suppliers include Frances Valeo and Michelin, German engineering firm EDAG and Finnish contract manufacturer Valmet Automotive, which plans to start producing the luxury sedan in the fourth quarter. Sales are scheduled to start in Europe, North America and Asia in 2010. Valmet also will produce Fiskers convertible version of the car, the Karma S (for Sunset). Sales are due to start in 2011. Valmet assembles the Porsche Boxster and Cayman. That contract expires in 2012, at which time the cars will move to rival Magna Steyrs plant in Graz, Austria. Magna Steyr is part of megasupplier Magna International of Canada. Another part of the Magna family, Magna Intier, supplies the Karmas interior. Valmet spokeswoman Teija Aahlman is confident the companys plant can handle the overlap between the Porsche and Fisker models. We have plenty of space and capacity, and we are well known for rapid production startups, she said. All manufacturing operations from the welding of the spaceframe to the assembly of the doors, hood, mechanical components and interiors will be done by Valmet, as will painting, battery installation, final assembly and testing. "We were close to selecting Magna for the final assembly, but then we visited Valmet," said Bernhard Koehler, Fisker Automotive COO. Valmet will do the same for us as it now does for Porsche, Koehler said. While a new welding line will be built to make the Karmas body in white, the Fisker cars will go through the paint shops and all final assembly stages together with the Porsche models, Aahlman said. Output will ramp up to 15,000 units a year by mid-2010, CEO Henrik Fisker told ANE at the auto show. The figure will include the Karma S, which was shown as a concept at the show. More than 1,300 orders for the Karma sedan already have been received, Fisker said. He added that production could be expanded to about 19,000 units yearly if necessary. The Karma sedans US starting price is $87,900 (about 68,000). The convertible will cost more than $80,000, the CEO said. Starting prices for Europe have not been announced. Fisker, a native of Denmark, worked at BMW and Aston Martin before setting up his own company in the US. 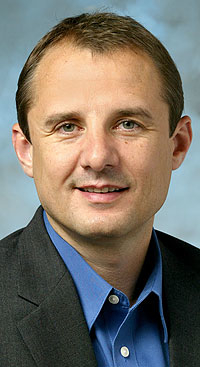 Koehler, a German national, has worked for BMW and Ford.